While The Lutheran Church—Missouri Synod holds Martin Luther in high esteem for his bold proclamation and clear articulation of the teachings of Scripture, it deeply regrets and deplores statements made by Luther which express a negative and hostile attitude toward the Jews. In light of the many positive and caring statements concerning the Jews made by Luther throughout his lifetime, it would not be fair on the basis of these few regrettable (and uncharacteristic) negative statements, to characterize the reformer as “a rabid anti-Semite.” The LCMS, however, does not seek to “excuse” these statements of Luther, but denounces them (without denouncing Luther’s theology). 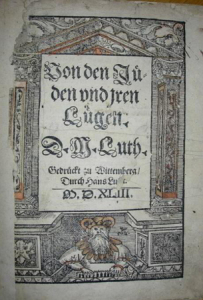 Resolved, That, in that light, we personally and individually adopt Luther’s final attitude toward the Jewish people, as evidenced in his last sermon: “We want to treat them with Christian love and to pray for them, so that they might become converted and would receive the Lord” (Weimar edition of Luther’s Works, Vol. 51, p. 195).